Years ago, a girlfriend gave me a Christmas card that announced she'd donated a goat to a community in my name. It warmed my heart to know the gift I received had helped others. Recently, the folks at Market Place, an organization dedicated to providing economic opportunities to low-income women in India, contacted me to see if I'd like to review one of their garments. "Absolutely," I said. 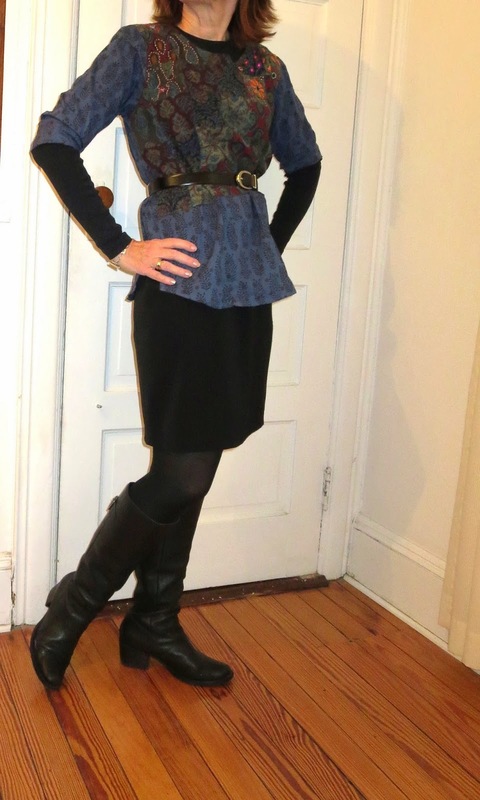 With the holiday season--a time for counting one's blessing and helping those less fortunate--upon us, I welcomed the chance to learn more about a fair-trade, non-profit organization that creates flattering fashions for women over 50 and helps ours. 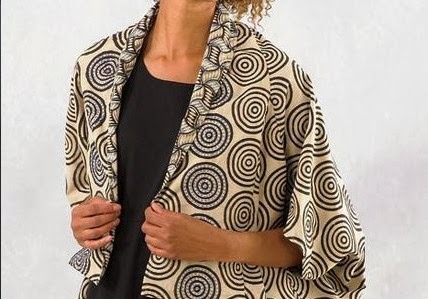 According to its Mission statement, Market Place works with 480 artisans who are organized into 14 independent cooperatives that produce women's apparel and home decor goods. Besides being in charge of their own businesses, these women are given education and enrichment opportunities to help them overcome personal, cultural and financial obstacles. For example Leadership-building programs are giving these artisans the tools and confidence to become social activists, tackling such problems as lack of clean water, insufficient garbage collection, and domestic violence. Together, these women produce a full line of women's clothing--dresses, tops, tunics, jackets, pants, skirts and accessories. While the collection celebrates traditional Indian prints in rich colors (very popular during the 60s and 70s), it also gives a nod to fashion's current cravings for black and neutral tones (below). There's also a large number of colorful cotton tunics, which is a very trendy look for women over 50. 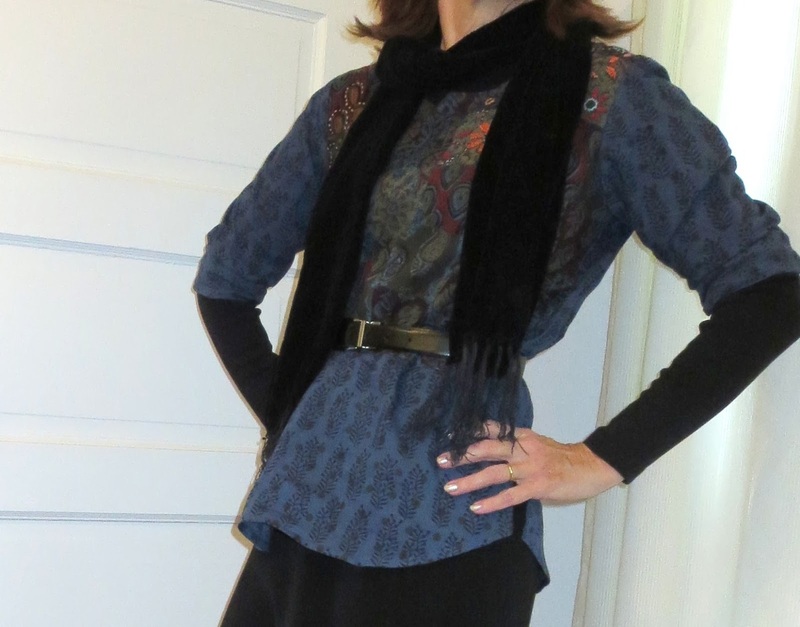 A few days ago, I received a Divya Top (featured in this post's photos). The minute I put on the top, I was transported to my college days, when I bought colorful Indian print bedspreads at shop called Azuma in New York City. The Divya Top's patchwork of traditional Indian prints stirred up a lot of memories! Since my college fashions included both Indian imports and blue jeans, I decided to pair the two for this post. I added a black sweater jacket and booties to update the look a little. The soft cotton and roomy design make it super comfortable. And if you've ever own anything made of the imported 100% cotton, you know it just gets softer with every washing. The top also has a touch of bright-colored embroidery work near the neck opening, which adds a lovely playful element. As a skirt lover, I had to style the top with a skirt as well. In the cooler weather, I will layer the top over a long sleeve T-shirt. I've styled the top with a belt because I like a little structure. Below the belt, the soft cotton almost takes on a peplum look, which is great for tummy coverage. I also like it with a scarf. Again, I'm pairing the top with lots of black because a) I'm a New Yorker and that's what we do, and b) I think it gives it an updated look. 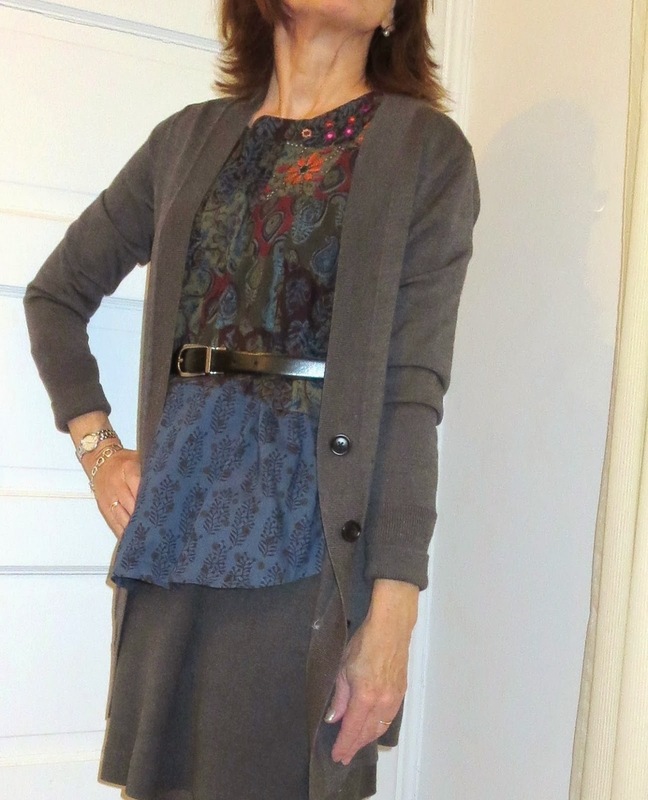 However, I also like the way it looks with a grey boyfriend sweater and knit skirt. I'm sure as time passes, I will come up with lots of other ways to style my new top. It makes me smile when I put it on, knowing I'm promoting a organization working to bring pride and dignity to women. In fact, I'm already considering another tunic for myself as well as some possible gifts for girlfriends and family. I know the over 50 women I know will be thrilled to discover their gift is helping others. Still Learning: What's Up with the Mustaches?